Give With Impact. It’s easy with our Charitable Gift Guide. Browse our extensive catalogue of charitable gift ideas that match your budget, and discover tangible ways charities can use your gift to make a real difference. Whether you choose to give a gift yourself or dedicate it to a loved one by sending a free eCard, you’ll feel good giving knowing the impact your donation will have. And, if you’re dedicating your gift, you can share the details on how the charity will use the gift in your personal message. Get Started: Browse Charitable Gift Ideas Now! 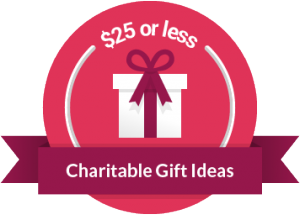 How far can a gift of $25 go? It can provide a goat to a family in Uganda, a nutritious lunch to someone for a week, or socks and underwear to those in need. Many charities make a small amount go a long way. For less than $100, you can make a big difference. Cover the cost of violin rentals for an after school program, provide a water purification unit to a family in need, or provide essential items to operate a soup kitchen. A gift of $101 to $250 dollars can make a huge impact to charities. It can help provide education to students in Guatemala, it can send a family to camp, or it can provide pain medication. 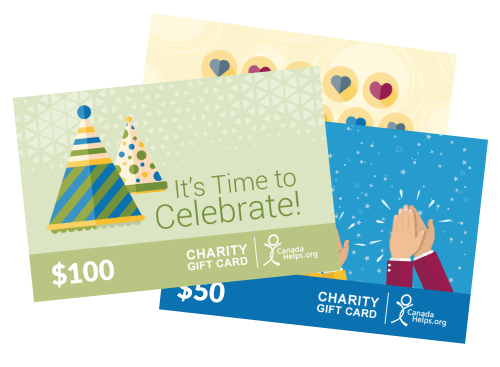 Inspire giving in others with a Charity Gift Card. You choose the design, value, and can include a personal message. The recipient chooses any charity or cause they are passionate about to receive the funds.